Are you satisfied with your 1&1 IONOS hosting package? Then recommend us and earn up to £300 in commission. You don't have to start from scratch. Get going with stunning designs featuring imagery and text content tailor-made for your industry or idea. Individualise as you wish with ease. 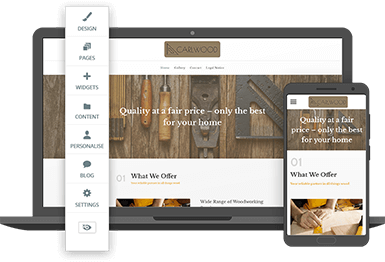 All templates are responsive and mobile-friendly, so you can present yourself in style – on a smartphone, tablet, and desktop. Thanks to the flexible editor, you have everything you need to build your site yourself, saving you the cost and hassle of hiring an agency or freelancer. Effortlessly drag and drop components and sections, change colour schemes, and integrate content from YouTube and Vimeo. You can also edit your website from any device while on the go. MyWebsite's unique templates are mobile-optimised, meaning they run perfectly and display beautifully on desktops, smartphones, and tablets. Templates come with an image pool of 17,000 photos to make your site pop, and you are also free to upload your own photos. Don't be intimidated by a blank page - Choose your industry and you'll get a matching template with pre-filled text and image suggestions to get you started. While you work on your full site, visitors can still view the important information about your business with your Online Business Card. Create stunning newsletters and campaign emails with the email marketing manager to keep in touch with customers. When your business has special offers for a limited time or reaches important milestones, spread the word on Facebook, Twitter, or Instagram and celebrate with your customers. Easily create a blog to keep your site's content fresh and engaging. MyWebsite helps improve your search engine ranking so more people will find you. Learn more about SEO with tutorials so you can optimise even further for search engines like Google, Bing, and Yahoo! Edit your website without worrying; you can always revert changes. Multiple backup or alternative versions of your website can be archived for you to switch between versions, such as to promote time-sensitive campaigns. MyWebsite's Shop package comes with an integrated online shop that's so easy to set up, you'll be selling online in no time. Add up to 5,000 products, and manage every aspect of your inventory with just a few clicks. Make it easy for customers to buy from you by accepting all popular payment methods like payment in advance, credit cards and PayPal. You can also choose your preferred shipping method or use the built-in online shop options. Beautiful templates related to your hobby, club, etc. Our georedundant data centres are among the most secure in the world. Want to get your business online right away? MyWebsite Design ServicePressed for time? With 1&1 IONOS MyWebsite Design Service, our experts create your professional website according to your wishes. Up to 5 beautifully-designed pages with customised images and SEO-optimised text, and of course your personalised logo – we take care of it all for you. Customers choose 1&1 IONOS because unlike free website builders, MyWebsite is built to be unique. 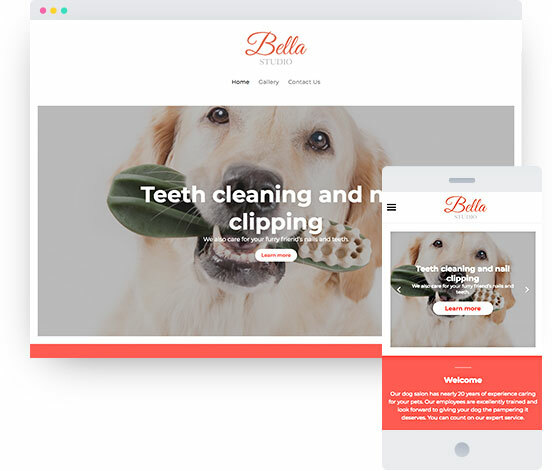 It's a flexible website builder that doesn't require any special skills, but is also fully customisable, so you aren't limited to just a handful of designs. Without a hefty time and money commitment, you can create a one-of-a-kind site that your visitors will love. Can 1&1 IONOS help me to create a website? Yes. 1&1 IONOS offers powerful website building solutions that enable you to make your own website with ease. In fact, it's now simpler than ever to create your own website from scratch using 1&1 IONOS MyWebsite. To guide you during your first steps, you'll find a large pool of predefined templates to make your own website. With other professional widgets like Maps, online scheduling, newsletter tool or RSS feeds you can choose the features that best suit your web project – perfect for those beginning their own website success story and looking to get a running start in the online world. Create a website with functional and professional elements that your customers will want to return to again and again. Include widgets and HTML elements, videos and YouTube content, social networking support and many more when you build your own website with 1&1 IONOS. Take advantage of the intuitive tools that make 1&1 IONOS MyWebsite one of the most simple and powerful website builder solutions on the market today. Our website builder enables you to save a lot of time during the setup of your website by using intuitive drag and drop functionality, simple colour scheme selection and a user-friendly tool for image editing. Easily integrate social media with Facebook, Twitter, Pinterest and Google+ to regularly interact with your website audience. You can also create a website and edit pages using your tablet device thanks to the Touch Mode. MyWebsite is optimised for a touch-editing experience, meaning you can use all of the same desktop features of the 1&1 IONOS website builder tool to quickly and easily edit pages of your website on your tablet device too. What do I need to know before creating a website? Whether looking for certain products or services, or researching a specific topic, the internet is almost everybody's go-to resource. It is therefore very important for companies, organisations and self-employed people or freelancers, to have their own internet presence. These days, this is the only way to ensure that your services and offers will be noticed. Websites can be used to display a personal story or a family story. With such sites, it is common to explain one's interests and career path with photos – and the themes are more often than not part of the webmaster's personal experience. In addition to this, personal websites are often created for special occasions (weddings, additions to the family, etc.). This type of website is often used as a diary that is viewable to the public. A blog (long form: weblog) is a website that mostly publishes content in the style of a diary or a magazine. Similarly to the private website option above, all content focuses on the blogger. However, in contrast to a private website, a blog usually centres on one specific theme or topic. In terms of blog content, there are almost no limits; popular themes include popular culture, fashion, lifestyle, technology or politics. With high-quality and sought-after content, texts suited to your target audience and an appealing web design, it is easy to set up a successful blog that also earns money. The most common web applications for the creation of a blog are wordpress.com, blogger.com and tumblr.com. The internet is full of images in all shapes and sizes – so much so that some there are a number of websites that are almost entirely dedicated to them. Artist and photographer websites, as well as sites for furniture, jewellery or fashion brands, also include a lot of imagery. Generally speaking, photo galleries are a great option for companies or businesses that need to display a number of products or references. The way in which a photo gallery is embedded on a website depends on the system used to create your website, or your website builder. There is also a large selection of social media platforms that offer a simple method of publishing and circulating images (for example: Instagram, Pinterest or Flickr). Some people use their website for professional purposes and upload their C.V. as well as further information on their professional career and some work samples. A referral to somebody's promotional website can make your application stand out from the crowd and act as a testament to a forward-thinking and initiative-showing applicant – as long as it is well presented and aesthetically pleasing. To ensure that your personal data is not open to the public, protect your private documents (personal résumé, certificates, etc.) in a password-protected section of your website. This way, you simply have to send the password to the relevant person dealing with your application. For business relations it is a good idea to build a website in the style of a business card. The great advantage of business cards is the speed with which they can be designed. A single page for basic information and contact options is also sufficient. Some online business cards are made from a number of web pages in order to display certain information separately, such as your own portfolio. Online business cards for both companies and self-employed people, have the same purpose as promotional websites for people on job hunts; your internet presence displays your personal strengths and should contribute to your personal success. Regardless of whether your digital business card is a single page or a complete website, this is normally the starting point for small companies in the digital world – especially for small businesses and self-employed people – and eventually grows into a full-fledged business website. Company websites usually have a larger amount of content and a deeper structure than online business cards. Depending on the sector or the firm, business websites usually contain content that has an informative or entertaining function. An online presence can strengthen a company's image, it can be used as a marketing platform for new publications and services, or provide support as well as communication channels for the target group. The same applies to the websites of self-employed people and organisations that do not solely aim to make a profit. Many company websites do not just inform about their various products and services, but also offer a service to purchase or order such items directly via their website. There are also many sites that exist exclusively for specific products or brands. If the focus of a commercial website is on the sale of goods, then it is considered an online shop. E-commerce is an integral part of everyday life for many people and an end to the online trading boom is nowhere near in sight. For those wanting to create their own online shop, a fully-functioning and specified website is of course required. In addition to this, there are a number of other aspects to take note of: before creating an online shop, it is important to first create a business plan. Other areas of responsibility include the distribution of purchased goods and the search engine optimisation (SEO) of the online shop in order to make it more visible in Google search results. In addition to this, as an online retailer there are various legal frameworks that must be adhered to. Which MyWebsite package should I use to build my website? All packages are available at an attractive price regardless of what stage your business is at – some of the larger packages not only include the basic features, but also thousands of industry-specific design templates, hundreds of web apps and thousands of images stored in the 1&1 IONOS image library. Regardless of which package you choose, they are all suitable for anybody who wants to create a simple and functional personal or business website. Our more comprehensive packages are the best value for money and are suited to a sales-oriented business website. They can offer all the basics alongside some extra features such as marketing tools (for SEO, Facebook, newsletters, analytics), professional mail packages, and a Wildcard SSL certificate for securing unlimited subdomains. If you are creating your internet presence the classic way – with a HTML editor and CSS – or relying on tools such as a Content Management System (CMS) or a website builder, both depend heavily on your previous knowledge and experience in website design. HTML is a markup language used to create pages on the World Wide Web with information and various features. During the early internet days, HTML (Hypertext Markup Language) was a very important part of designing a website and there was no other option but to write the HTML source code yourself in order to create your own website. There are of course other options for website design that do not involve directly working with the source code of a site: for this purpose a Content Management System (CMS) or a website builder (also known as a website toolbox) can be used. Such software simplifies the structure and creation of a website with an easy-to-use user interface that makes them suitable for web design beginners and allows the creation of a website to be done quickly and intuitively. However, such tools can at times be limited in terms of design options. Aside from web design program for beginners, there are various CMS that also meet professional requirements – most of these are CMS rather than website builders. Many of the well-known CMS offer a lot of freedom when designing a website, but for this you also require a certain degree of familiarisation with the software. When working with a CMS the content is separated from the design, making it easier to manage. In practice, a pre-made template (a design template), which can be modified at a later point, is usually used for the design. With many CMS you can also take over the design completely, for which an external web editor is usually used. Most of the creative possibilities are self-evident if you write the source code yourself and design your website through the use of programming languages. Nonetheless, many CMS offer an excellent variety in terms of web design. On the one hand, the CMS developers regularly update the applications and design features in keeping with modern web design. On the other hand, especially in terms of CMS, the community contributes greatly to the improvement of the tool by developing extensions, tools and templates (free or paid). It is recommendable for total beginners to take advantage of the uncomplicated web builders as they are easy to use and, despite their limited functionality, are quite sufficient for the creation of many website types. Beginners can also create an attractive website with 1&1 IONOS – for this, no knowledge of HTML, CSS, or any programming language is required. Our developers have ensured that each phase of creating a website is made as easy as possible. With each one of our packages, we provide you with server capacity and your desired domain (availability differs in packages). We offer hundreds of industry-related designs and images, all you need to do is select and create your website according to your preference. The appearance of the backend, the place where all alterations take place, largely corresponds to that of the frontend. This allows you to keep an eye on how the end result looks when you design your web pages. All it takes is the click of a mouse to activate certain elements, and then move them into the desired position. Using a versatile editor allows you to easily write a text for your site – use it to adjust the font size and make other formatting adjustments such as underlining text. In addition to this, photos, videos and links can be easily integrated. Create your own website with one of our MyWebsite packages – all of which do not require knowledge of computer languages like HTML or CSS. All you need to build a website with us is an idea, some time, and some willingness to have fun! Successful results can be seen in just a short period of time. These days, why is it popular to set up a blog when creating a website? In recent years, creating a blog or a website has become more accessible with various software, platforms and organisations. Traditionally, websites are used for more static content such as business and contact information as well as more detailed features like online shops, reservation portals or contact forms. Blogs on the other hand are used for more topical or changing content such as news and updates and perhaps photo or video content. Users opt for both a website and a blog because they provide both individuals and businesses with a complete digital presence. While a website acts as a reliable and informative reference point, a blog provides content directly to your customers and allows you to regularly update them on business developments. A blog not only keeps customers and consumers in the loop, but it also increases your website traffic and therefore your services or products. Blogs also provide a social and interactive aspect; they allow you to comment and follow other blogs and create a supportive and connected digital community. For social media also, blogs provide more shareable content and engage users, encourage social interaction, and therefore add value to your website. Aside from maintaining and fostering healthy relationships with your customers, a business blog will improve a company's Google ranking and provide visible benefits all round. How can I make a website for smartphones and tablets? If you're considering building your own website for today's eCommerce market, you should always keep in mind how your website may appear on portable devices such as smartphones and tablet computers. Website statistics show that more than 30 percent of all visitors are accessing and researching website content through mobile devices. Our website builder lets you take advantage of responsive web design to ensure that the website you create displays correctly on both computer monitors and mobile devices. Alongside responsive web design, 1&1 IONOS's website builder also offers the integration of more than 300 mobile-ready Web Apps. Among the most popular is the Twitter Web App that allows you to connect your account to your website for online marketing purposes. In addition to this, you can also integrate apps from Facebook, eBay, Google+ and Amazon. Finally, if you wish to make changes to your site whilst on the move, you can also log in via your smartphone – simply visit the 1&1 IONOS Control Panel for full access. Are there any security and legal aspects to keep in mind when creating a website? When you build your website with 1&1 IONOS MyWebsite, you can expect unparalleled safety and security. Your website will be safe for visitors, and your data and software will be secured against hackers and other types of data loss. What's more, when you use our website builder, you will also be safe from viruses, malware and other threats. Our high-performance data centres are subject to German data-protection standards which are among the strictest in the world. In addition to this, your website data is secured using geo-redundant servers to ensure maximum protection. When transmitting data through our fibre optic connections, we ensure multiple security measures through encryption, and an external firewall. When building a website you might be thinking about the legal requirements found on other professional websites. Should you have any questions or issues regarding security or legal operation, our experts are on hand via telephone or email. The 1&1 IONOS Website Builder: how do I incorporate images and videos on my website? It's a breeze to insert images and videos with the MyWebsite tool. Simply select "insert element" and then "basics". Now you can quickly and easily drag and drop images to insert them on your website. By using the button "edit image", you add image effects and also adjust the size, sharpness and focus. If multiple images are to be displayed in succession, then simply drag the element "image gallery" in the "image and videos" category to your site and then establish the sequence settings, such as how many seconds each image is visible before the next one appears. It's also easy to include videos as you build your own website - under "images and videos" you can display video material from YouTube as well as Vimeo or SoundCloud. To embed video clips, you need only to use the video widget. That way your desired video is automatically linked to your website. I want to be found through search engines. How can the 1&1 IONOS Website Builder help? Creating a website is only half the work - high-ranking search engine results are essential to a website's performance; around 50 percent of all purchases online are made using a search engine. In addition to this, it allows people to find your website online and helps you appear ahead of your competitors. For these reasons, it's important to have a sustainable, long-term search engine optimisation strategy. At 1&1 IONOS, we provide you with all the tools you need for better search engine placement. When you create a website with us, our powerful tools for successful online marketing will take you through your existing content, helping you to ensure that it's fully-optimised for search engine rankings. Can I create a website with other tools using 1&1 IONOS? There are a number of different options when it comes to webhosting. A good option for professionals may be to set up a private server that they administrate completely by themselves, while beginners may be more suited to webhosting packages that include security updates, and server maintenance. Whether you choose your own server or a webhosting solution, always ensure that your server performance and web space is well suited to your specific project or website. Good to know: some webhosts offer managed hosting and a 1-click installation of specialised hosting packages for well-known CMS that are tailored to the needs of the applications. To register a domain, contact a domain name registrar. You can also secure your new website address with 1&1 IONOS; the domain checker tool allows you to check if your desired domain is still available. If your preferred domain has already been taken, check if the same second level domain (website name) is available when combined with a different top level domain. For example: if www.example.com and www.example.de are not available, perhaps try other alternatives (.org, .net, .web, .online, etc.). In case you cannot find any suitable alternatives, it might be worth purchasing your desired domain from the owner. Once you've decided on a CMS, next you need to install the system on the webserver. With an FTP program, you can access your web space and upload and install everything you need. Alternatively, many webhosts offer a so-called 1-click installation to set up your CMS. The installation is very simple and the provider takes care of everything for you. Once your CMS is set up, it is important to find the right layout for you. Ideally, the basic planning of your business website is already complete, otherwise you need to consider your target group, the layout and the exact content, sections and structure of your site all at once.